The most important feature of an effective resume is that it is truthful. I can guarantee that someone, someday will spot a lie on your resume and will call you out on it. Worse, they will deem you untrustworthy and pass on casting you. → If your film or television credits are extra work, call them either extra work or give them a general descriptive title, i.e. restaurant patron or street pedestrian. Do not give your extra character an actual name in hopes of duping someone into thinking you actually had a speaking part. You can list yourself as a “featured extra” if you did have individual screen time. 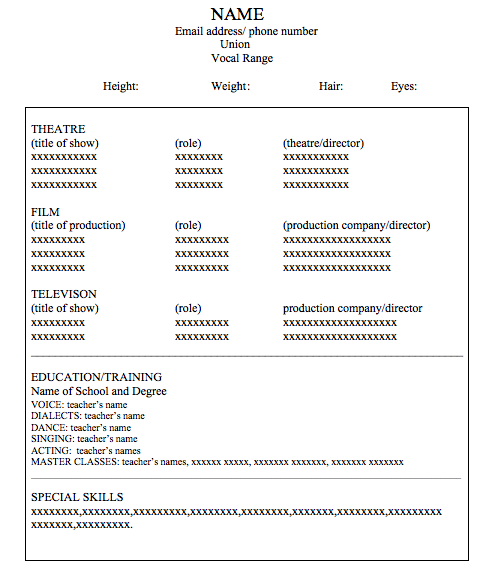 → If your theatrical credits are ensemble, again list them as ensemble. I totally understand that a resume with few credits cries out for some padding, but best to pad it with your training and skills then with work that you have not done. Do not name people on your resume that you have not actually worked with. → If you have done a master class with a person of name recognition, list that as a master class rather than having studied with them. We can accept that someone leading a master class will not remember everyone in the class, but if you say you studied with them we then assume that this person is familiar with your work. If we happen to check with this person and they don’t remember you we assume that you have padded that credit. *Be sure to check and re-check that you have spelled everyone’s name correctly. People often get offended if their name is misspelled. → One of the things that we look for when perusing a resume is names that we recognize. If you have worked with anyone that may have name recognition be sure to include them, even if it is simply your participation in a master class. If you have not worked with any such folks then, of course, listing your local directors, mentors and teachers is perfectly acceptable. Include both when you can. The resume should be set up in such a way that it can be read at a glance. We often spend just a few seconds on a resume. We also like to read in clearly delineated columns rather than straight across. Each column should have a heading in typeset different from the lists below them. You should include in these columns all the information necessary for us to make an accurate evaluation of each credit that you list. For example, it is not helpful if you list a play or a film/TV credit without also naming the theatre, director, and/or the production company that employed you. 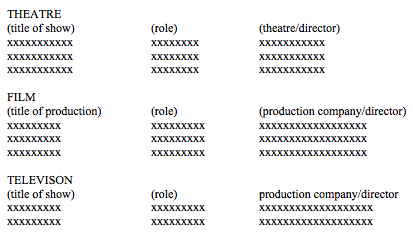 It is equally not helpful to name a play without telling us what role you played in that production. The headings can change according to your experience. You can separate your theatre credits into BROADWAY, OFF-BROADWAY, TOURS, REGIONAL or just NEW YORK and REGIONAL. Or you could separate them into PROFESSIONAL, UNIVERSITY, STAGED READINGS. Or even separate them into MUSICALS, and NON MUSICALS. You can also combine headings, i.e. FILM/ TV or BROADWAY/OFF-BROADWAY. The headings will all depend on your credits. 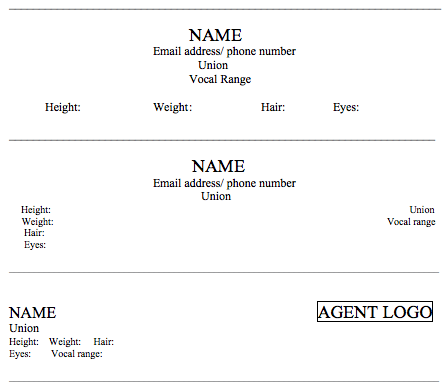 You should head the entire resume with your name, contact information, and any statistics that you want to include, like union affiliations, vocal range, agent representation, height and weight. Your name should be that largest and boldest print on the page. Here is a sample of an easy to read resume. Feel free to be creative with fonts.